Woven on the Ashford 16″ (40cm) rigid heddle loom using the 7.5dpi (30/10cm) reed the first 12″ (30cm) was woven with just the Colinette slub yarn with one row of mohair in between. 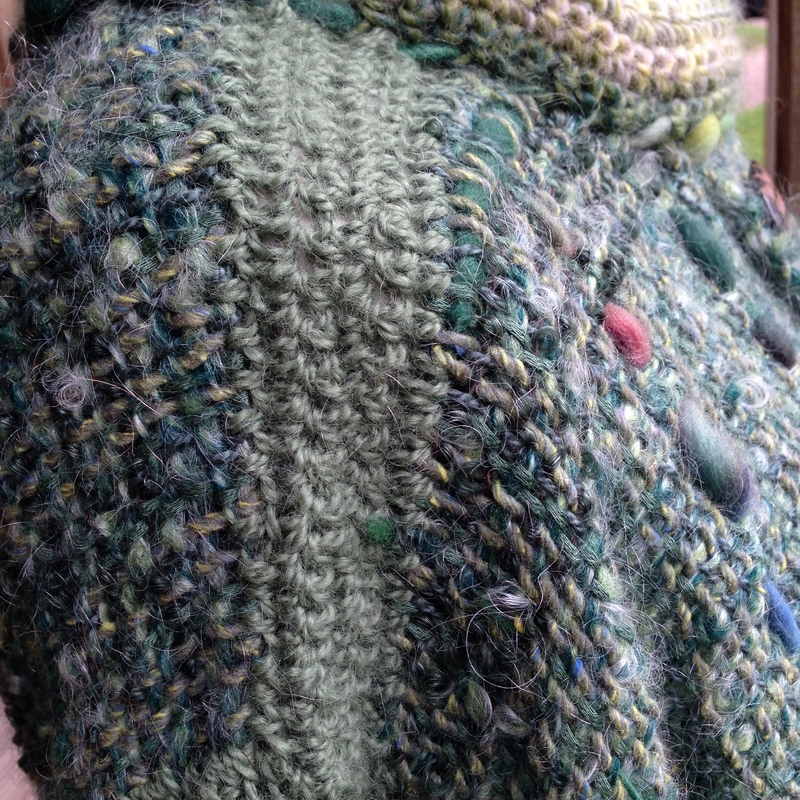 The warp was a mixture of odd balls of mohair and wool, all shades of green. Warps like this are great for using up odd balls of yarn within a colour palette. 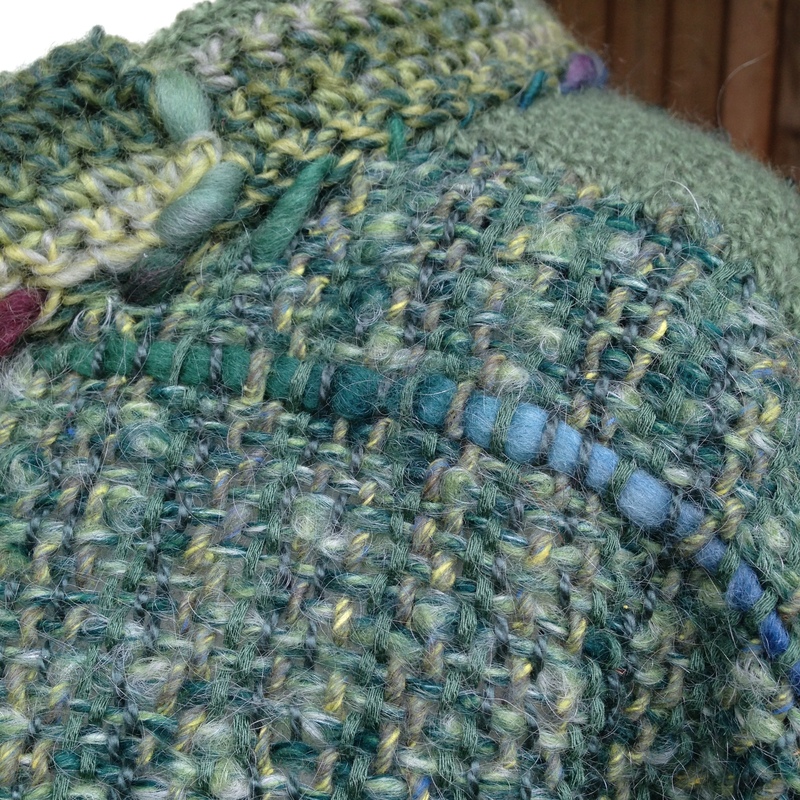 This can create an interesting and subtle light change to the weft yarns. The only golden rule is to always use the same yarn for both selvedges so that the weaving will tension evenly. 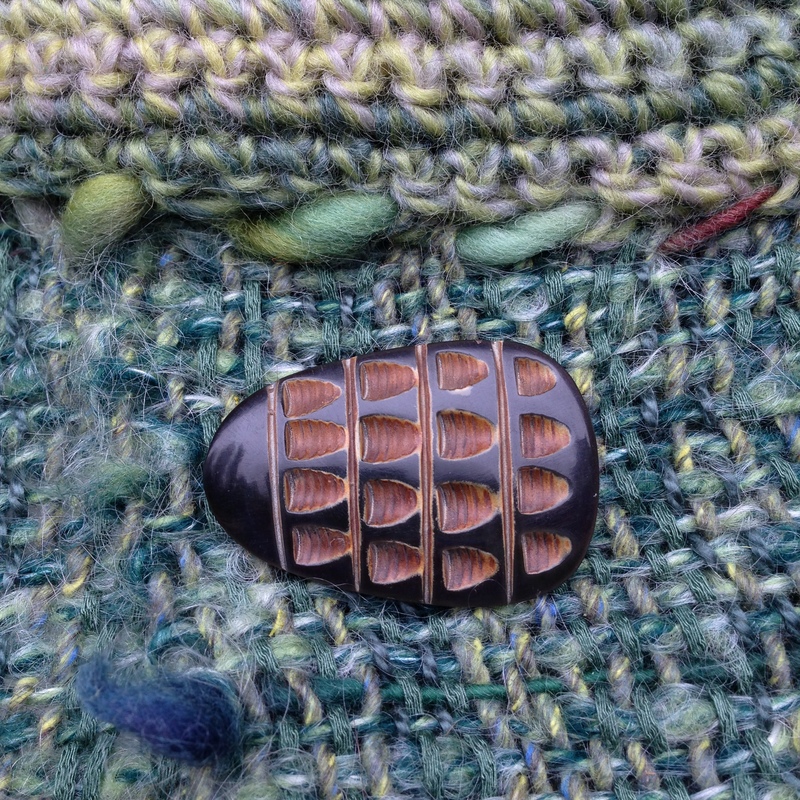 This glorious button that I bought at Woolfest in Cumbria holds the two fronts together and does not undo. 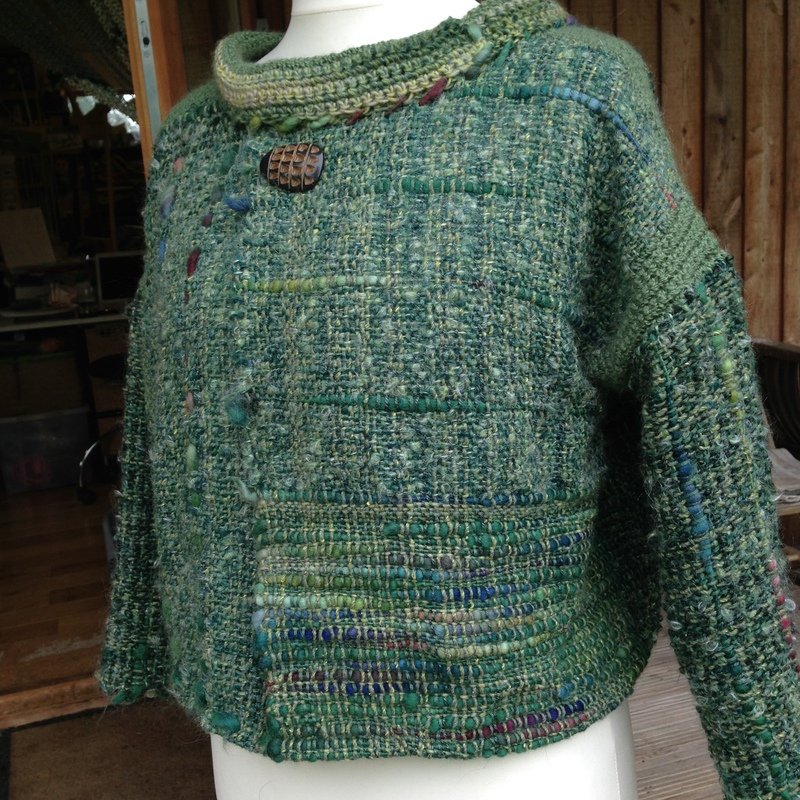 The garment goes over your head, like a jumper, although all the pieces are hand woven and not knitted and the fabric is cut out using a jacket sewing pattern. The open weave gives the fabric a soft, gentle feel more like knitting than tweed. The “jumper” feel to this garment is achieved by crocheting the woven pieces together, along the shoulder seams and around the sleeves. 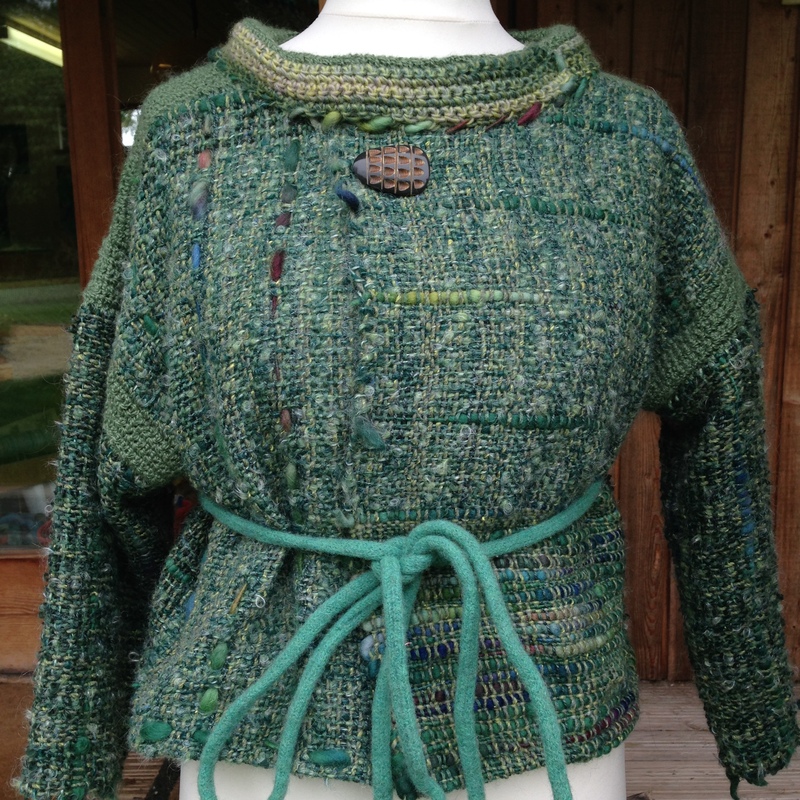 The collar is also crochet, and stitched down using the Colinette slub yarn. By using the same yarn for the crochet as you used in the warp the two areas blend together and the crochet certainly makes joining all the pieces together very easy. The crochet collar made from some of the warp and weft yarns just seems to blend in seamlessly and feels very nice around the neck. Here I have belted it using a felted eye cord from an Elizabeth Zimmerman Pattern. 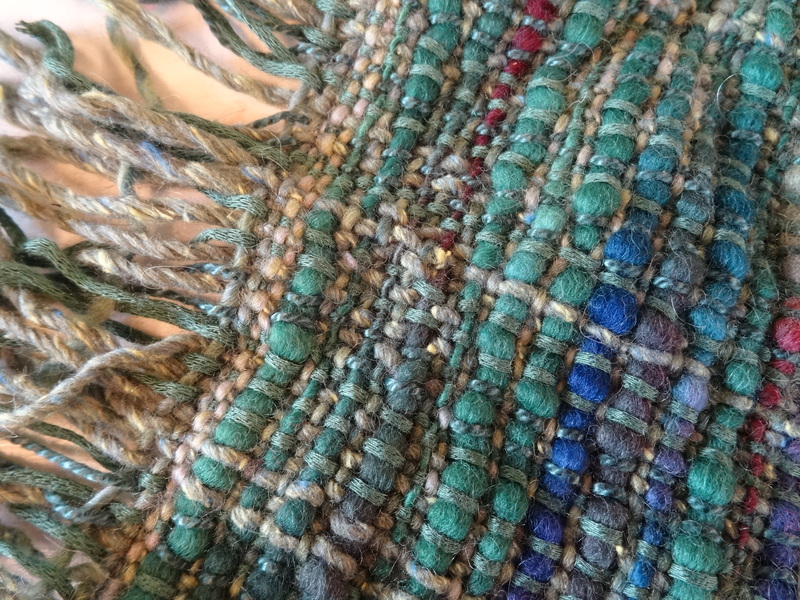 This is a really easy, fun piece of weaving where you can try using all sorts of yarns together to make a woven length of about 200″ (508cm). This will give you enough fabric to make this top in a medium size. The 16″ (40cm) width is just the right size for the pattern pieces but if you want to make it wider, weave on any 20″ (50cm) rigid heddle loom, adding another 50″ (127cm) to your warp length. It is really good weight for this time of year so do hope you will have a go. Remember to use the Woven Iron-on Interfacing on all your cut edges before you start to sew. I love this and it is GREEN!!! What a great job and what inspiration, FUN. Thank you.